﻿ Ultimate Thermofit Pills Review: Is it Safe? 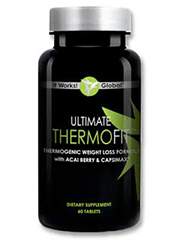 Featuring an all natural blend of thermogenic ingredients, Ultimate Thermofit is intended to provide a change in weight with some unique exotic ingredients. Fortunately there is information about this product beyond just the stated claims. The front of the bottle exclaims “It Works!” but to facilitate your knowledge of this brand here is a full scale analysis to allow you the right to make an educated decision on what weight loss product fits your individual purpose. Much like other thermogenics, this one intends to reduce weight by making the loss of calories easier and by reducing appetite. Some of the supposed added benefits is the ability to give more energy and to provide some meaningful antioxidants for a better immune system. The thermogenics in this lineup include raspberry ketones which are here to also increase metabolism. Capsicum fruit in a patented form which has some small fat burning effects. Green tea extract is also present for antioxidants and for an increase in metabolism. Guarana of course is a high caffeine source and it has antioxidant properties as well. Finally going into the other ingredients such as bitter melon which is used to reduce blood sugar levels, yet the studies performed have still been inconclusive. Dandelion is presented to act as a diuretic, so extra water supplementation is needed therefore. Gymnema lead is here as well for a decrease in blood sugar as well. Looking at the public reviews is a bit tricky since the company works as a multi level marketing business. Sales are offered by normal people who become distributors and most of the positive reviews on this product are from people who drop their contact information to purchase from them. Some of the verified purchase reviews are from disgruntled customers who add they experienced no change. Here you can find all the supplements that rank to suit your demands. There is some promising additions here such as raspberry ketones. Very expensive and only available from those who gain commission off the product. Also has many negative reviews. Fortunately most of the bad reviews are not about the side effects, simply put people say they felt nothing change at all. It really can be seen in how little they add. Only 33 mg of raspberry ketones are added, well below what other brands offer. Most of the product comes from a blend of guarana, green tea and other much less expensive ingredients which can be bought elsewhere. Despite the lack of positive reviews you can compare it to other brands. See for yourself how this ranks among the very best. left by distributors. It seems that looking at the ingredients there could be some benefit, but the amounts of beneficial ingredients is incredibly low in its strength and incredibly high in its cost. There are suitable options intended to work that you can view now. One beneficial aspect is the addition of raspberry ketones, though it would have been nice to get more of it. YMaking the right decision for your own needs is a simple process. Just look at the very best including access to the number 1 ranked brand.